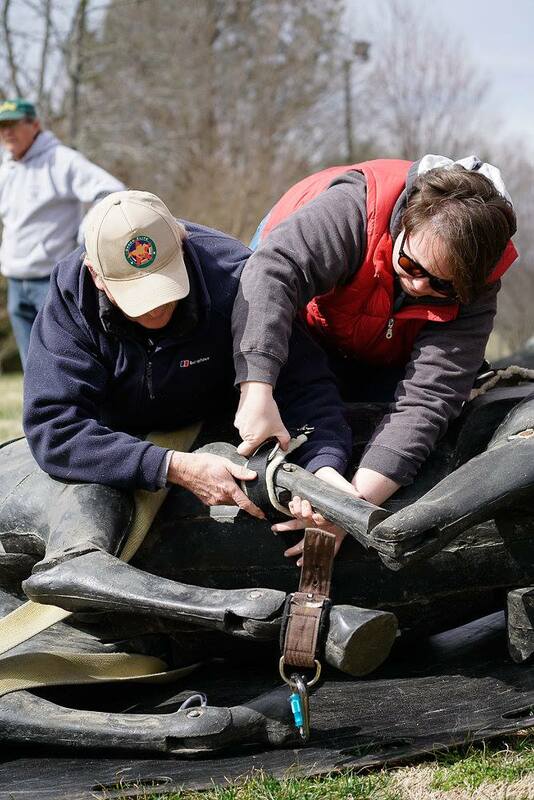 Volunteers practice using Lucky, the 700lb plastic training horse. Lucky gets hobbles at training session in 2016. 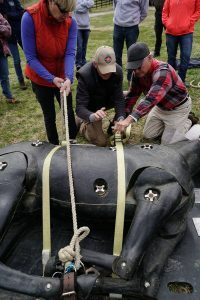 PEER is proud to announce that we will be hosting our second Large Animal Rescue Training Techniques Course taught by Roger Lauze. Roger is the the head coordinator for Equine Rescue & Training of the MSPCA. His clinic will be July 15th & 16th, 2017 from 9AM – 4PM held at FENCE. Registration 8:30 – 9AM. 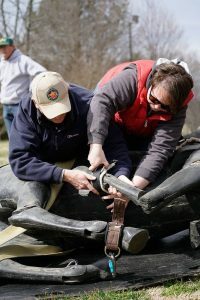 The course is 2 days of “hands on” techniques covering a wide range of possible conditions and equipment. Registration limited to the first 24 of those eligible. The clinic is free of charge to those registered. Please sign up as soon as possible by calling Dianne at 828-894-3200. Auditors are welcome, but will also need to sign up. Our first mega event “Coveralls to Couture” on Saturday, May 16th, 2015 from 3-5PM. emceed by Pam Stone, was an afternoon tea full of fun, food and equestrian and down on the farm fashion. 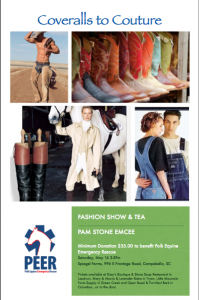 Thank you to Spiegel Farm for hosting our event, to the Farm House for donating the fashions, and for all of your help with raising money to purchase our new truck for the ambulance. Included in the show was the traditional 18th century Casaca, which was worn by Portuguese bullfighters when doing rejoneo (bullfighting on horseback) and the Spanish traje corto, worn by Spanish dignitaries and the el Rosio, which was a religious pilgrimage in the south of Spain still held today. We also had classic western, classic Paso Fino, and contemporary formal dressage on the runway.